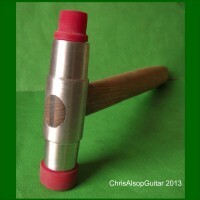 We offer a wide variety of tools for guitar maintenance and repair that are designed and manufactured by Chris Alsop in his workshops in Derbyshire, United Kingdom. As we manufacture all our tools and specialise in diamond cutting tools, we can also offer specialist tools made to your specification. Please contact us with any queries regarding specification, manufacture or advice. Frets need to be rounded to remove the flat tops after levelling, or when you dress frets to remove .. This is a diamond file with a permanently bonded oak handle. It is designed to be guided along the f..
Fret Dressing File. 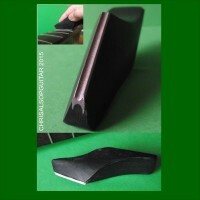 Tapered diamond file with all edges ground. Beech handle which has Angle Raised ..
Fretting Hammer with four 16mm & 20mm faces of Brass and Rubber, designed and manufactured by Ch.. 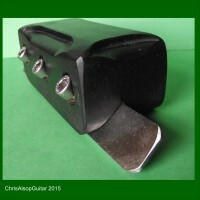 This is a pair of fret pullers - we modify a standard pair of pliers by hand grinding and reshaping .. 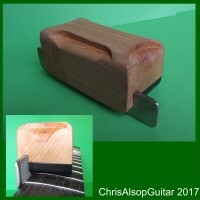 This is a diamond file mounted in a holder which allows it to be guided along the fretboard with the..
Fret Bevel File, 35 and 90 degrees. Diamond File. 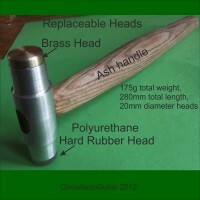 These fret wire cutters are a high quality large end cutter that has been precision ground by us for..
Fretting Hammer with 3 faces: 15mm, 20mm, 24mm Polyurethane Rubber Faces, designed and manufac..
Fretting Hammer with two 20mm faces of Brass and Rubber, designed and manufactured by Chris Alsop. ..